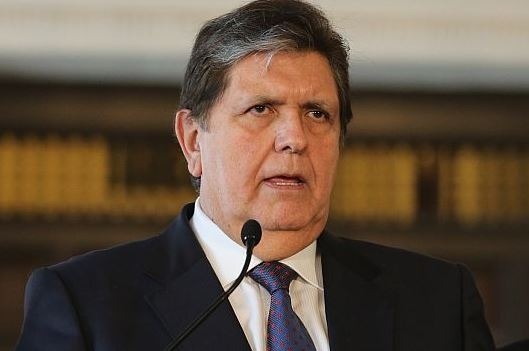 Peru’s former President Alan Garcia died in a hospital in Lima on Wednesday after shooting himself as police arrived at his house to arrest him in connection with a bribery probe. Casimiro Ulloa hospital in the capital, Lima, said he was in surgery where he was being treated for “a bullet wound to his head”. Mr García was 69, and was accused of taking bribes from Brazilian construction company Odebrecht but he repeatedly denied any wrongdoing. Officers had been sent to arrest him in connection with the allegations. Interior Minister Carlos Morán told reporters that when police arrived, Mr Garcia asked to make a phone call and went into a room and closed the door. Minutes later, a shot rang out, Mr Morán said. Police forced the door open and found Mr Garcia sitting on a chair with a bullet wound to his head. The current President Martin Vizcarra said on Twitter that he was consternated by Garcia’s death, and sent his condolences to his family members. Investigators say he took bribes from Odebrecht during his second term in office, linked to a metro line building project in the capital. Odebrecht admitted paying almost US$ 30 million (eur£ 23 million) in bribes in Peru since 2004. But Mr García says he is the victim of political persecution, writing in a tweet on Tuesday that there is “no clue or evidence” against him.